Photographer Tod Papageorge reflects on the links between American sports and the Vietnam War. 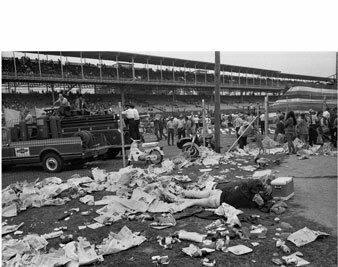 Tod Papageorge Race Day, Indianapolis 500 (May 30, 1970). I was using a different machine. On the one hand, the project was shaped by my tremendous feelings about the war, which of course weren’t unique. But on the other hand, I was intrigued with the notion of going out and photographing these stadiums full of thousands of people and using a wide-angle lens to do it, a lens that could draw in hundreds of people in a single photograph. And with the problem of making coherent pictures out of it. But in a way it’s in the service of an idea about the society, also in the service of my own rage at that time, the rage I was feeling. American sport. What is a sport in biology? A mutant. A sport is a biological mutant. So you see the war in the games? It’s Eliot’s objective correlative. Sports, these events, become a kind of arena of material or possibility for shaping into what I feel about the war. Which was, you have to understand, inseparable from what I just generally felt. It’s not as if I decided: aha, I’m going to go out and expose America through photographing sporting events. It was nothing like that at all. What do you think of contemporary photography? This work, and work of this ilk, came out of a group of photographers who were working in the ’60s and the ’70s in New York who were all, I think, radicalized by the publication of Robert Frank’s The Americans. So I guess consistent with all of this work is a kind of negative view of America, a critique of America, done, again, in the interest of nothing but aesthetic or artistic success. In other words, there’s no money to be made doing this. There was something very pure about it. As Garry Winogrand once said, it’s fit work for a grown man. Or a grown woman. I understand. It was a different time. [Laughter] That’s right. And Diane [Arbus], Diane was working then! But with the success of the galleries, the defining energy became that provided by money. And so what do you see now when you go to a gallery that’s selling photography? You see big, huge color prints, most of which really aren’t about very much. They’re illustrations. [Points to the cover of his book] No mind could ever imagine that concatenation of forms. I mean, maybe Velázquez could, but it would take him eight months to paint it out. So I’m not very interested in most photography today, because it is defined by the galleries. It’s going to be very interesting to see what’s going to happen with the economy going down the tubes. It’s just what I do. Some poets spend their whole lives writing sonnets. You’ve spoken elsewhere about poetry. Well, photographers and poets, their glory and their shame–that’s a quote from Auden, the glory and the shame–is that a poet has to depend upon words, these words. “Cup”–it’s so mundane and common–but Robert Frost would say, “fill a cup up/Up to the brim, and even above the brim.” The word becomes transformed, ideally. So the curse of the poet is, he has to use all of this pain quotidien to make magic. And it’s the same with the photographer. He’s stuck with the things of the world to transform. What you must understand is that the effort involved here in making these pictures or any that I’ve made is to make visual poetry. In other words, to use the material of the world as the stuff of transformation into meaning. So whether those facts or those pieces of material bear any kind of conclusive or direct line of connection to the truth is totally irrelevant to me. This has nothing to do with the truth! This is a book of poetry. Whether you respond to it that way is something I can’t be concerned with. But that’s the ambition. Here. [Flips to a photo, above, of lovers lying in the trash just outside the Indianapolis 500 racetrack] This is so bizarre, this couple.